Easily attaches to the Professional Inflatable Spearfishing Float, the mesh bag is designed to hold water bottles, flares, strobes, etc. Velcro strap secures mesh bag to float through the custom D rings on the float. 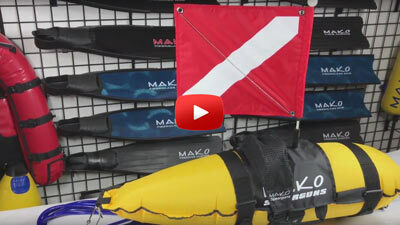 Note: Our Mesh Bag is not compatible with the MAKO Hawaiian Hard Float. Love this product! It fits perfect and have plenty of space for small items. You can combine and use two of them to have even more space. It even fits my other inflatable float! Can fit to diff floats. good for little stuff, e.g. a little torch, or a small bottle of water. I hope the size of this bag to be bigger.